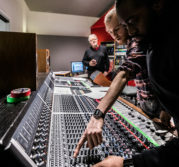 This week, we’re delighted to announce that we’ve installed a brand new mixing desk in the control room at Visconti Studio. Our old, some might say vintage, Audient console had served the studio well, but was getting to the stage where it was needing some serious TLC. Whilst we were scratching our heads about what to do, serendipity struck, in the form of an email from our friends at Audient. Bryn Wildish, Audient’s UK Market Manager, got in touch to say he was going to be in the locale and could he come for a tour of the studio. “Aha!” we thought! Bryn did come and visit. It was great to show him round and discuss how well our current desk had served both Tony and Mary Epworth on the pilot project, but also years of Kingston University Music Dept students – the old desk had been installed in 2007 and used extensively in teaching recording and production techniques on our Undergraduate and Postgraduate courses. 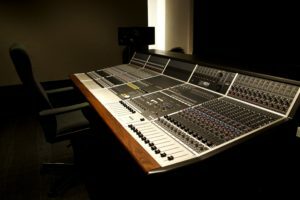 Further to consultation with Tony, it was decided that the sensible thing to do would be to retire the old desk, replacing it with a brand new, shiny Audient ASP8024 Heritage Edition. 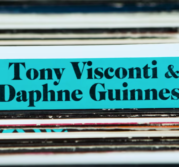 On behalf of the Visconti Studio team, a huge thank you to Audient for their help and support with this – here’s to many wonderful future recordings.